Toddler busy boxes are part of our flexible daily routine. They help me to homeschool older children or get some chores done while my toddlers and preschoolers are well occupied on a worthwhile task. Our busy boxes (and ziploc bag activities, tot school, workjobs, shoebox tasks, preschool or Montessori style tray activities) are only available at certain times in the day to keep them fresh and interesting and to stop them getting spread throughout the house. We use them during school time in the morning and for table activities while I am getting dinner on the table in the evening. That way I do not need to change them too often because the children’s interest stays high and I can also keep some degree of supervision over the messier trays to avoid major pack up sessions afterwards. 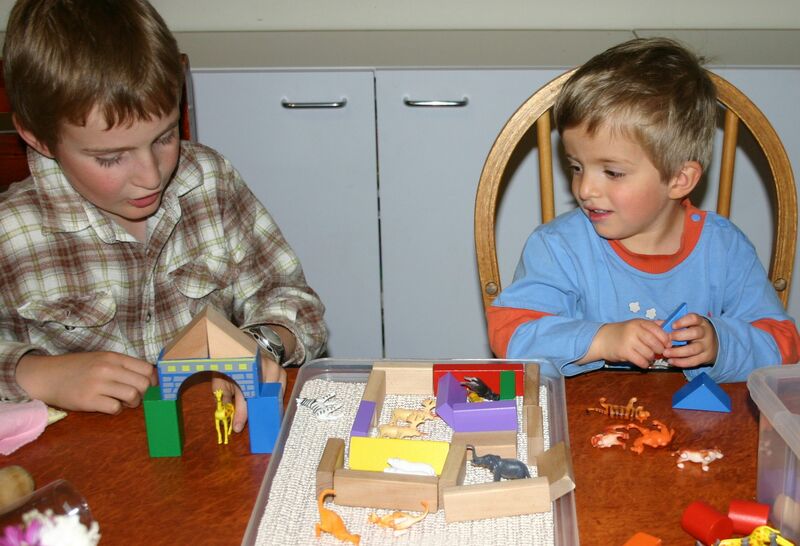 They are also excellent to use for buddy time when an older child is assigned to play with a younger sibling. This is useful for example when the younger children have already finished playpen or room time and I just need an extra 20 minutes or so to finish working with one of the older children to complete their school activities. Turning toddlers loose to wander unattended throughout the house is bound to end in trouble, so some time with an older sister or brother gives the older children a break from their school work and builds good sibling relationships at the same time. The older children enjoy the responsibility because they do not get asked to do it all the time or for very long periods of time. It also gives them an excuse to play with all those attractive tubs as well! 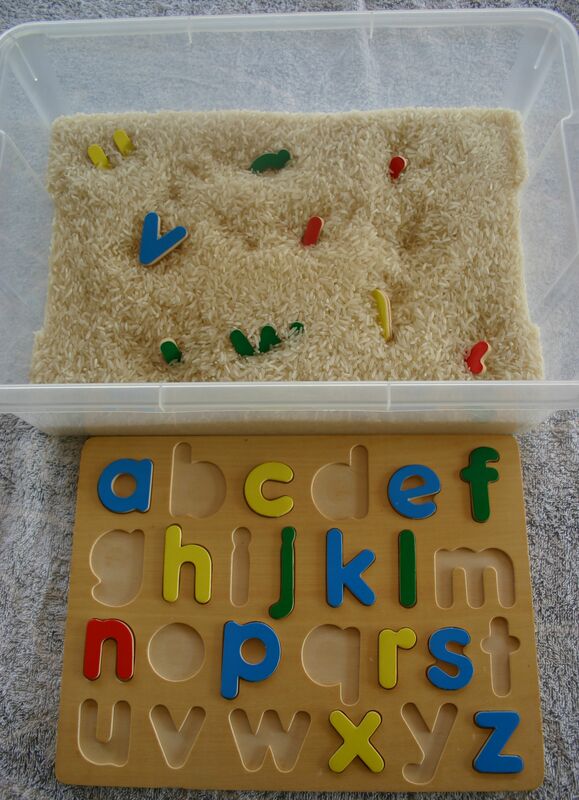 This set of busy boxes is for my 3 year old twins, but many could be adapted to suit toddlers and older babies too. There are heaps of ideas on my other posts for the younger age group. 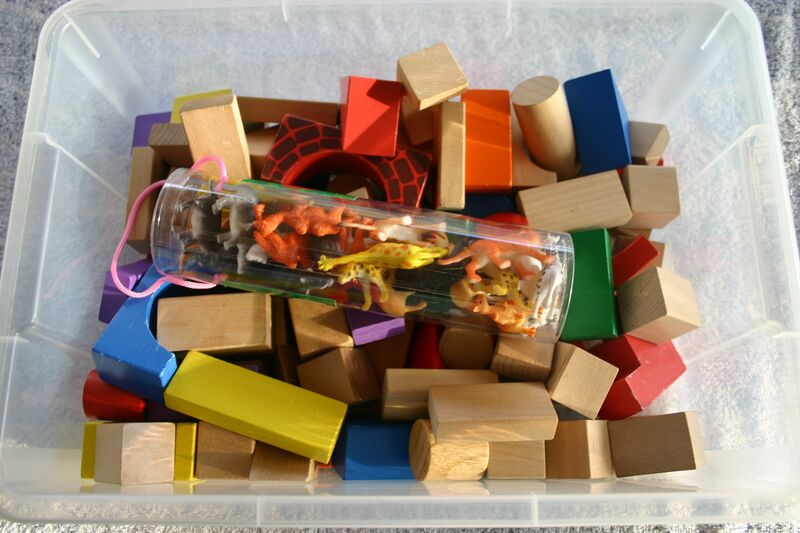 Plastic animals and wooden blocks for building corals, zoos, farms and houses. Jenga blocks work well too. 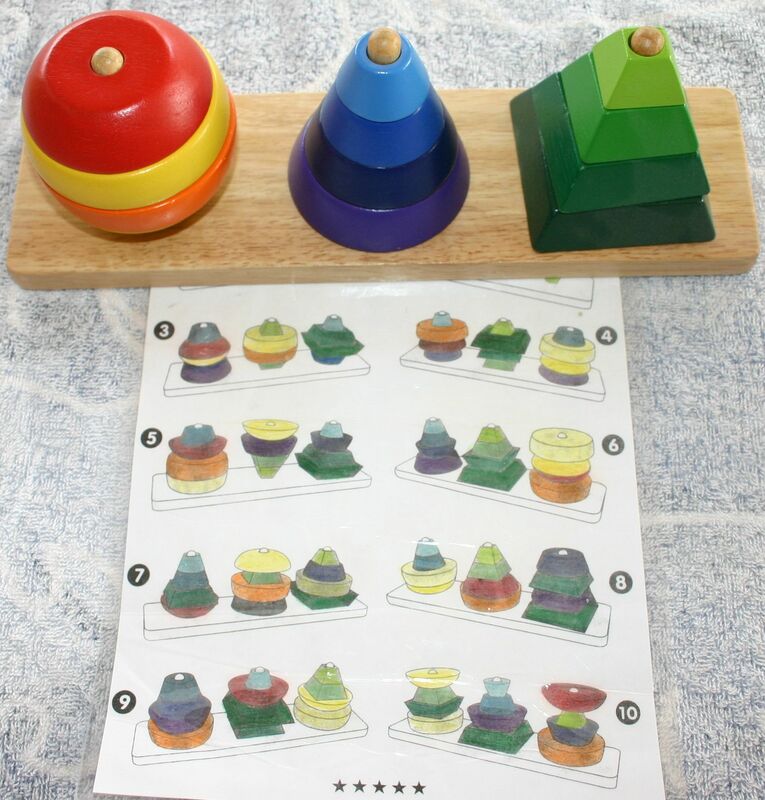 The 3 year olds have been learning how to recognise the numerals 1 to 5 and count small items. 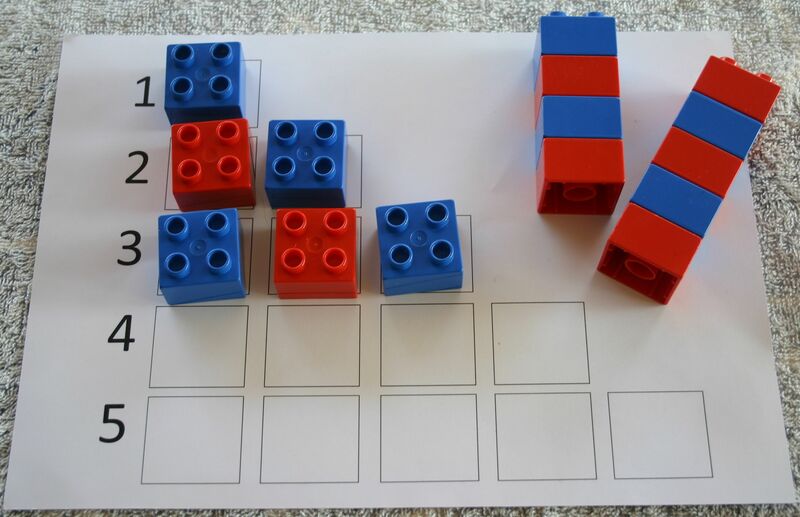 Combining building with Duplo as well makes this counting tray attractive, particularly to boys. 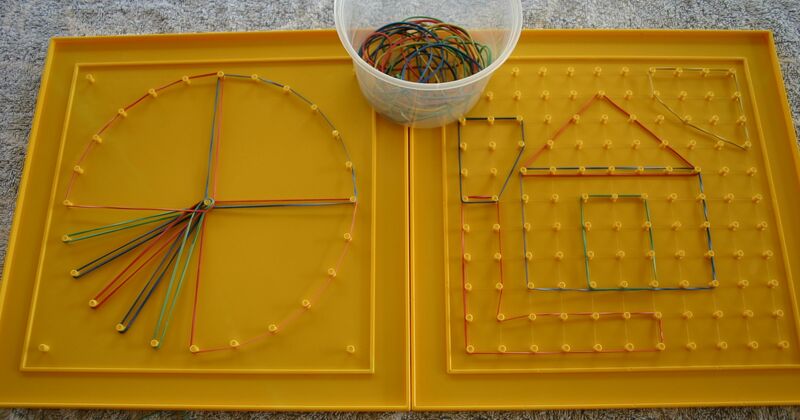 Geoboards are a commercially produced mathematics tool. 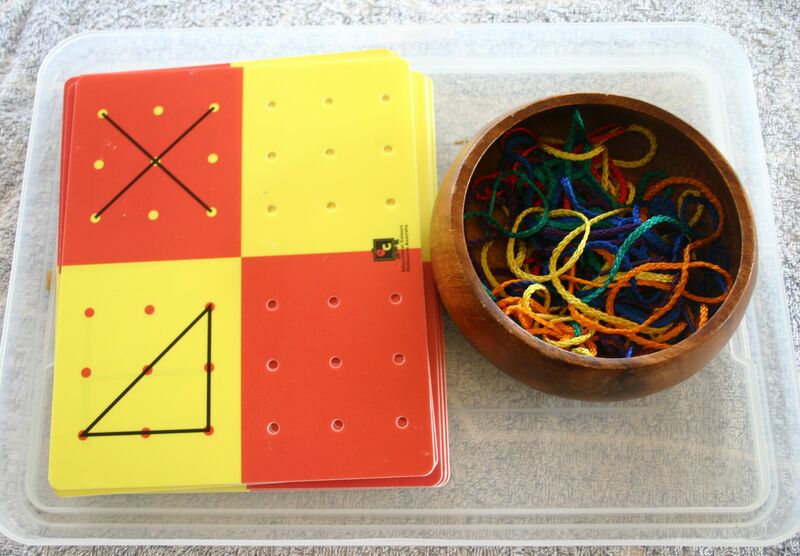 Great for exploring geometric shapes, perimeter, fractions or just for making pictures with elastic bands. 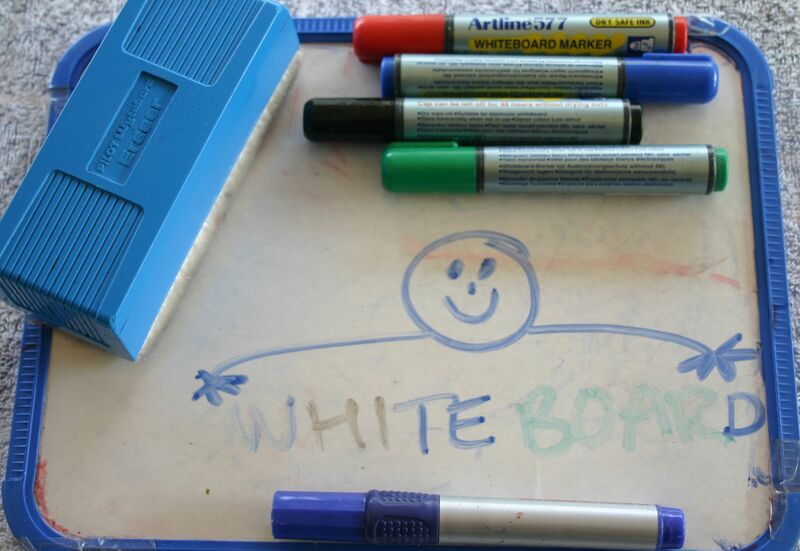 Personal dry erase boards (whiteboards) with pens and an eraser. Sewing and lacing cards. These have a shape drawn for the children to copy. There are plenty of sewing and lacing shapes around to buy or make your own by punching holes around a cardboard picture using a hole punch. Sorting buttons into muffin trays is a hit with all ages. There is just something about handling all those different shapes and textures. The twins haven’t even gotten their hands on these yet – the 6, 8 and 10 year olds have been monopolizing them! Teaching toddlers to cut provides them with an absorbing activity that is great for their fine motor skills. The twins have had experience with all the materials in this box so this is just an assortment to chop up any old way they like. 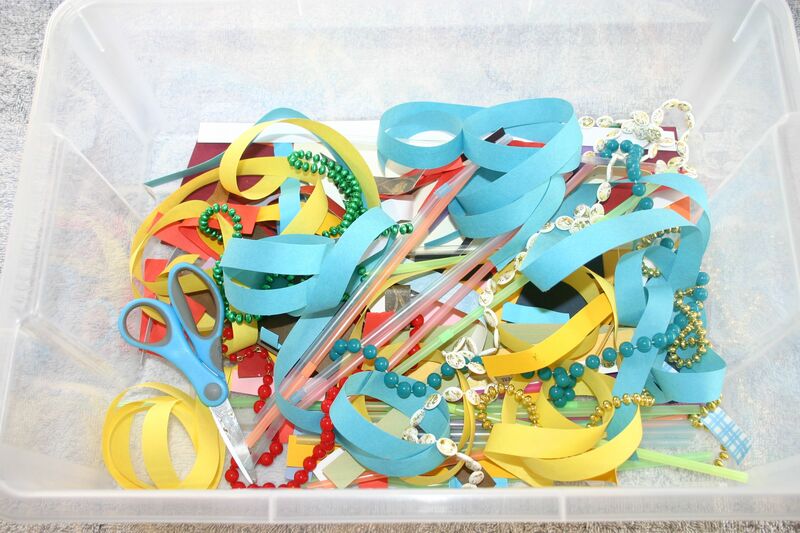 Paper streamers, card strips, beads, straws and other oddments such as tinsel or curling ribbon could be included. We let the bits fall back into the box and they can eventually be used for collage later on. The cutting box with free printable patterns I prepared a little while back was too advanced for them so I have put it away to use later on. A collection of good quality wooden puzzles is a good investment. This one came with a variety of patterns for the children to copy, making it much more long-lasting. Teaching toddlers to glue is another open-ended activity that they will love. 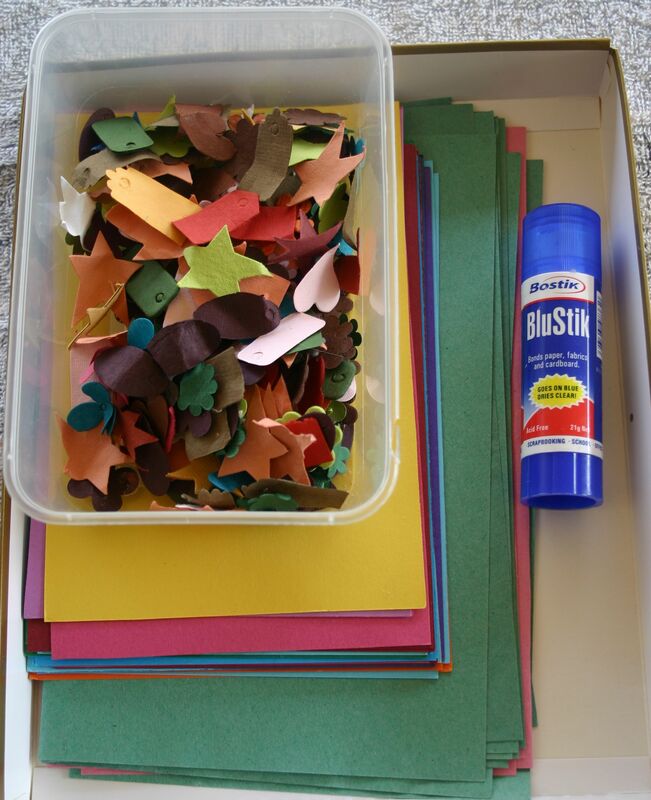 Using a glue stick makes it a lot less messy to begin with. A selection of coloured card pieces and diecut shapes from a Kmart scrapbooking assortment pack made this very easy to prepare. Sensory tubs have so many applications. Finding puzzles pieces hidden in rice is pictured above. See here for many more ideas. Do-a-dot pictures are great for fine motor skills. 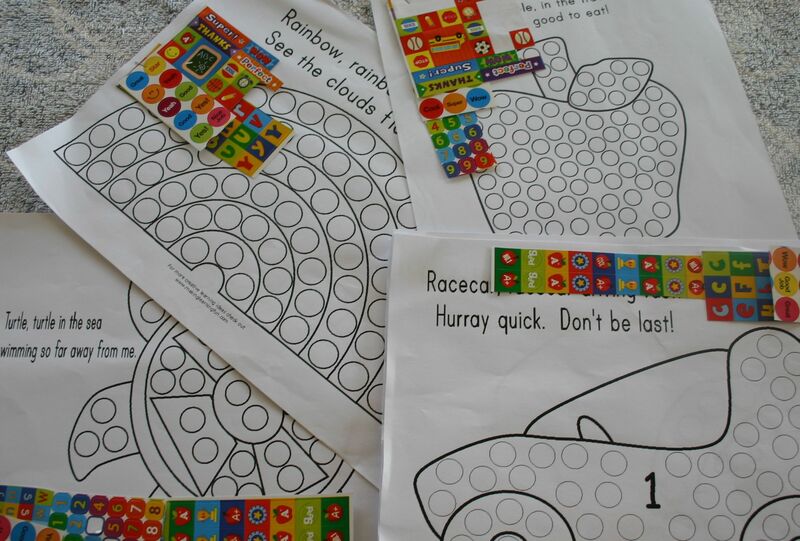 Bingo dot markers can be used to dot inside the circles or provide small stickers to peel and stick into the dots. There are tonnes of free printable do-a-dot pictures around if you do a quick google search. Imaginative cooking and doll/teddy play is always a hit. 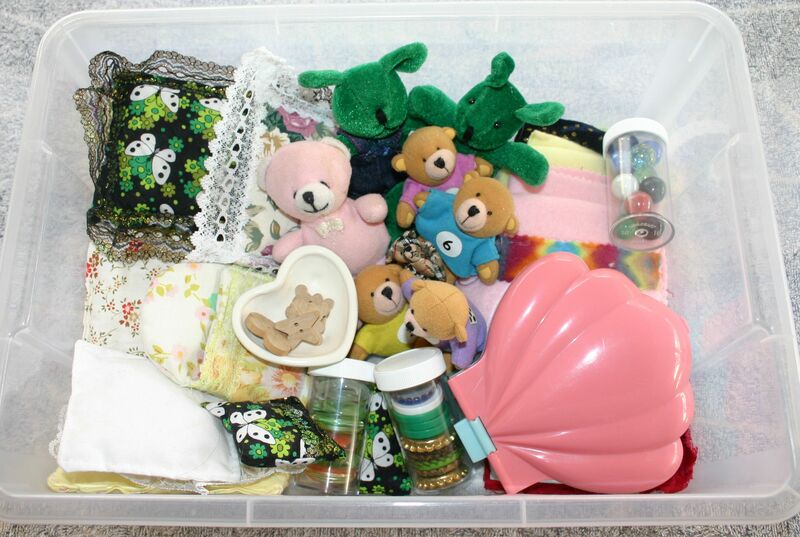 Small teddies, mini pillows, sheets and blankets, along with marbles, jewels and wooden button food makes an interesting selection. Bottle top plates and an old polly pocket toy as well as some screw-top jars finish it off. 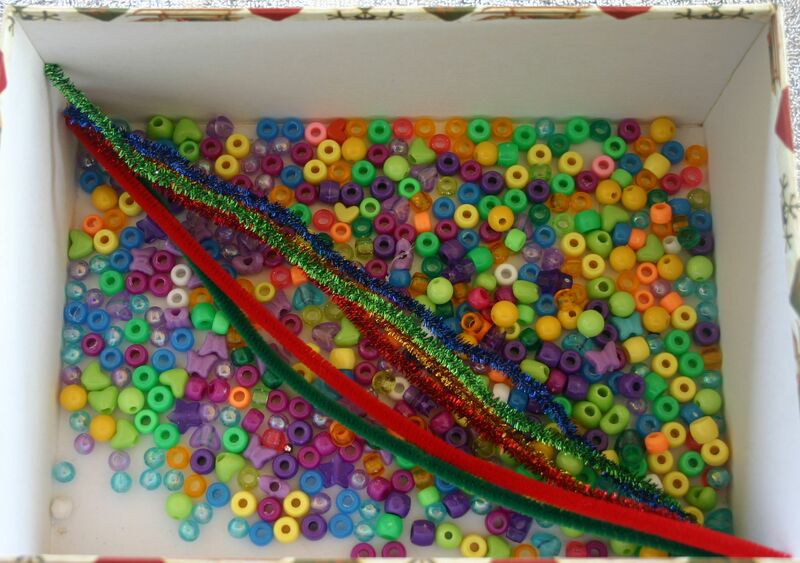 Pony beads and pipecleaners are great for threading and can be made into bracelets or tipped off and re-used next time. 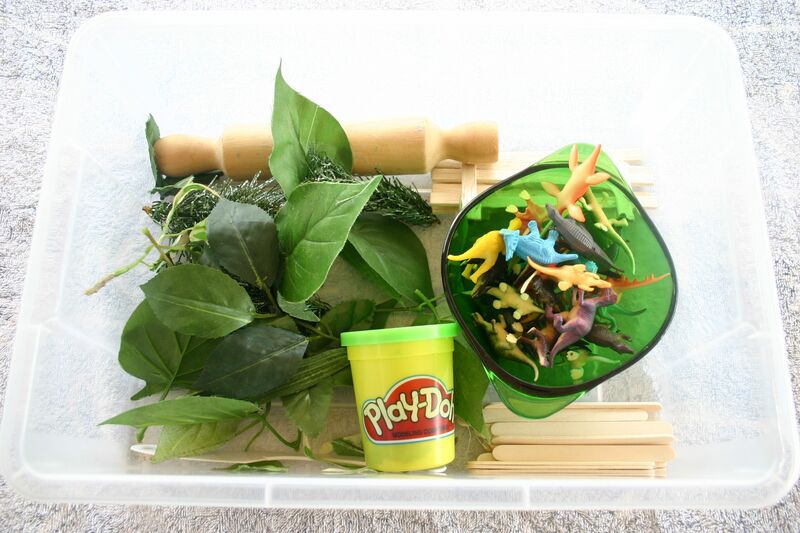 Our dinosaur tub includes play dough, plastic dinosaurs, popsicle sticks and popstick fences, a rolling-pin and plastic knife and some artificial leaves for plants and trees. The green bowl has been used to make a pond, cave and home for them as well. Make sure you choose activities that are age appropriate, can be used independently, include attractive materials, are easily accessible, and easy to pack away. Being able to throw everything back into a robust plastic tub makes it easy for children to keep the activities together and tidy up after themselves. The key to using these kinds of activities with your young children successfully though is training. No amount of pretty materials will keep a fidgety toddler with the attention span of a flea sitting in one spot for any length of time on a day-to-day basis. As soon as the novelty wears off they will be up and off again. Take the time to train your children to stay in a designated area. (See mat time/blanket time and highchair time.) Introducing young babies to playpen time that transitions to room time later on is an excellent way to begin (see starting late) and the highchair and table make excellent places to sit a child with an engaging activity while you are nearby. Some children will naturally sit still for longer than others, but all can be trained to do so for a reasonable length of time. If you are too busy to train your children to sit and concentrate then you are too busy!! Give up some of those good things you do and take on the better thing of training your children. They will need these focussing and concentrating skills in later life, especially at school and your home and others will be blessed by a self-controlled toddler. For a list of toddler table activities, see here. For preschool ideas see here. For many more ideas for children of all ages, have a look around! For some more sensory tubs, try here.